Evening Primrose Oil Dosage may vary from 500 mg to 3000mg depending on the health condition. Below we will reveal correct evening primrose oil dosage for hormonal acne, menopause, pregnancy and weight loss. Fatty acids in evening primrose oil help with acne, reducing inflammation of the skin and helps it retain moisture. Several studies have shown, that supplements with gamma-linolenic acid can reduce both inflammatory and non-inflammatory acne lesions. 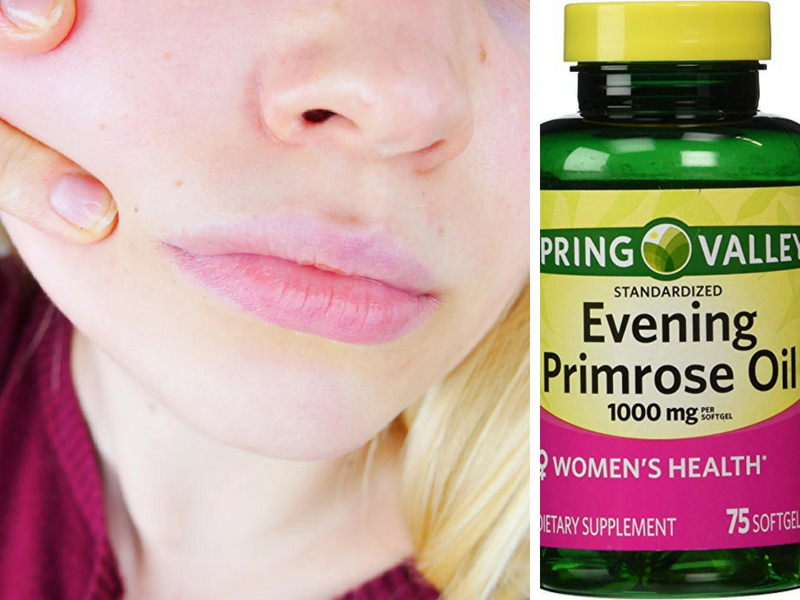 Evening primrose oil acne dosage equals to 1000mg daily. Most convenient would be to take one capsule of 1000mg per day. In some cases, the dose could be increased to 1-3 capsules per day (no more than 3000mg). Always take evening primrose supplements with your meal. If you’re approaching menopause or have already entered menopause, you might be concerned about some of the symptoms, such as hot flashes and difficulty sleeping. Evening Primrose Oil (EPO) is becoming very popular for the treatment of menopause symptoms such as mood swings, headaches, anxiety, fluid retention, irritability, and breast tenderness. As it is true for most herbal remedies, EPO must be taken for several weeks before symptom relief can be felt. Take 3,000 mg daily for the first 12 weeks to rebuild GLA stores and then 1,000 mg as a maintenance dose. Most women develop breast pain (mastalgia) at some stage in life. Some women with breast pain might not have high enough levels of Gamma Linoleic Acid (GLA), and EPO contains one of the highest concentration of GLA among herbal remedies. Dosage of EPO for breast pain is the following: take 3,000 mg daily for 6 months. Detailed information on benefits of evening primrose for breast pain you will find here. For rheumatoid arthritis take 540 mg (one capsule of 500mg) daily to 2800mg (5-6 capsules of 500mg) daily in divided doses. It may take up to six months until you see noticeable results. The dose is calculated on the basis of a clinical study . Evening primrose oil increases the speed with which triglycerides decompose into glycerol and fatty acids. Phospholipids contained in EPO help to dissolve the existing subcutaneous fat. For weight loss purposes take 3000-5000 mg of EPO daily. Starting at 35 weeks take 1 capsule (500 mg) of evening primrose oil orally. Starting around 37 weeks insert 1 capsule (500 mg) vaginally every evening before going to bed. Some women start to increase daily dosage to 2 capsules (1000 mg in total) at 36-37 weeks, and to 3 capsules (1500 mg in total) starting at week 38. The 4-capsule daily amount should be performed only in the last four weeks of your pregnancy. Best Evening Primrose Oil Dosage: 500mg, 1000mg or 1300mg? Often people ask themselves – how much evening primrose oil should I take? The recommended evening primrose oil dosage is 1-6 capsules a day, at a dose of 500 milligrams per capsule. Contents of evening primrose oil per capsule may be different for different brands. Therefore, always pay attention to the information on the label regarding the oil content. Best evening primrose oil brands produce 500 mg, 1000 mg, or 1300 mg capsules of evening primrose oil. For example, to cover the daily need of 3000 mg with 500mg capsules, you would have to take 6 capsules per day. Whereas with 1000mg you would have to take only 3 capsules of evening primrose oil per day. And the 1300mg content of GLA will cover your daily need with 2 capsules only. Some people have problems swallowing large tablets or capsules. Swallowing large capsules can be difficult and downright unpleasant. It causes one in three people to gag, vomit, or choke. If you are among those people, always consider the size of the evening primrose oil capsule. Usually, the higher the content of EPO shown on the bottle, the larger will be the capsule. I compared two sizes of capsules: the smaller one contains 500mg, and the larger one contains 1000mg. The 500mg capsule is twice as small as the 1000mg capsule. The 1300mg capsule would be even bigger than the 1000mg capsule of evening primrose oil. If you have troubles swallowing even the smallest pills, you might consider taking liquid evening primrose oil. The oil itself is tasteless and not very “oily”. So swallowing up to one-half teaspoon per day should not be a problem. This dose is the equivalent to five 500mg capsules (2500mg of evening primrose oil). Little CV, Parsons T. Herbal therapy for treating rheumatoid arthritis. Cochrane Database Syst Rev . 2000;(1):CD002947.